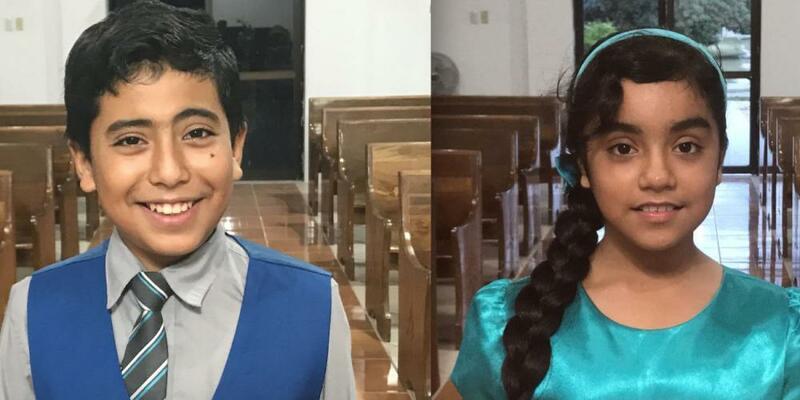 Two child preachers explain their calling in Belize. Practice singing “He’s Got the Whole World in His Hands” in Spanish to perform during the program (see page 31). Send home a note to remind parents of the program and to encourage the children to bring their Thirteenth Sabbath Offering on March 31. Remind everyone that mission offerings spread God’s Word around the world and that one-fourth of our Thirteenth Sabbath Offering goes directly to help people in the Inter-American Division. Interviewer: This quarter we have met people from Puerto Rico, Mexico, Jamaica, Trinidad and Tobago, and Belize, which are all countries in the Inter-American Division. Today we will meet two special children from Belize. Jerson [pronounced: herr-SON] is 12 years old, and he can’t decide whether he wants to be a medical doctor or a preacher. But he already has more experience as a preacher than a doctor. He has been preaching for five years. Dalisa [pronounced: da-LISA] is his 10-year-old sister. She has been preaching for three years. Jerson and Dalisa preach in English and Spanish. Tell us, Jerson, how did you start preaching? Jerson: Several pastors came to my church when I was seven years old and asked the children whether they wanted to learn to preach. My grandma volunteered me, and I said, “I’ll give it a try.” All the children who wanted to preach were sent to a special training camp. We learned how to speak and how to gesture. The pastors wrote sermons for us, and we practiced preaching in front of the other children. I was so nervous the first time that I stood up to speak in church. I went to the front, looked down at all the people, and started shaking. My knees wobbled the whole time that I spoke. When I came down, my grandma asked me if I was sick because my knees had wobbled so much! But it was an awesome experience. Preaching made me feel near to Jesus. The pastors who trained me said I had done a good job, and that made me want to try harder. Dalisa: I also started preaching at the age of seven at my grandma’s suggestion, and I also went to a training camp. My first sermon was at the Central Seventh-day Adventist Church in Corozal Town. At first I was really nervous because it was a big church and people came from other churches to worship. When I went up front, I was trembling. But as I started talking, I felt the nerves go away. Interviewer: You both were nervous the first time. What about now? Jerson: My second sermon was at a different church, and I spoke about the death of Christ, the Lamb that was slain. That sermon had a great impact on people. I saw people’s faces beaming as I spoke, and they wanted to shake my hand afterward. But God deserves all the praise because He helped me preach. Dalisa: I preach because it is something that I like to do. In addition to preaching on Sabbath, my brother and I have led several evangelistic campaigns. We just finished a campaign where Jerson preached three nights a week, I preached three nights a week, and a cousin who is our age preached one night a week. Over the past year, my brother and I have led 30 people to baptism, including our mother. Interviewer: Tell us about your parents. Jerson: My father is from India and travels a lot, so he doesn’t hear our sermons. I think that is why he isn’t an Adventist. Mom is from Belize and lives in Belize City, the biggest city in Belize. She was very busy as a teacher when we were born, so she sent us to live with our grandmother in another town. She visits us nearly every weekend. Dalisa: Our grandma used to belong to a Sunday church, but she liked to party more than go to church. When she grew older, she became a Seventh-day Adventist. Our parents sent my brother and me to live with her when we were small, so we grew up in the Adventist Church. Mom has helped us prepare our sermons for a long time, but she kept thinking, “I have two children who preach, and I’m not baptized.” Last Easter, she decided to be baptized when she heard my brother preach. Jerson: When Mom came forward during my altar call, I honestly felt like I wanted to cry. But I told myself, “I’m at the pulpit. I will not cry. I will not cry. I will not cry.” I gave Mom a big hug. Interviewer: How do you prepare for a sermon? Jerson: I always pray first. I ask God for wisdom and knowledge and the voice to express the message clearly. I ask God to let me be His instrument. Then I find a Bible verse that has had an impact on me. I take the verse and develop it into a sermon. I find related verses while keeping the main verse at the center. One of my favorite sermons is titled, “Your Teacher Is a Child” and comes from Matthew 19:14, where Jesus says, “Let the little children come to Me, and do not forbid them; for of such is the kingdom of heaven” (NKJV). I like to preach about how adults should be more like children. Dalisa: The pastor prepares the text of my sermons, and then I revise so I can speak only small words. I practice the sermon every day, and I pray. I also work on my hand gestures and the intonation of my voice. Interviewer: Why do you preach? Jerson: I preach because God gave me my life and cleansed me of sin. Shouldn’t I do something in return? Preaching is something that I do to give thanks to God. Dalisa: I know that when I preach, I am helping other people go to Jesus and receive His help. Preaching is a way of praising God. Interviewer: What do you want to be when you grow up? Jerson: For a long time, I’ve wanted to be a medical doctor because I thought that is how I could be like Christ to others. Now I am thinking about becoming a pastor. My mother says I can be both a doctor and a preacher. Interviewer: What advice would you give to other children who love Jesus? Jerson: Read your Bible and pray every day. The Bible is the message of Christ. If God has given us the Bible, we should not just read it for fun. If God has sent us this book, He didn’t send it to us for nothing. It is the word of Jesus who died for us. It is the most precious book in the world. Dalisa: And if you want to preach, pray to God first. Feel confident, and know that you can do it with God’s help. If it isn’t your talent to preach, God will tell you. But if it is your calling, God will help you. Interviewer: Thank you Dalisa and Jerson. Children and adults alike are sharing the gospel in Belize and across the Inter-American Division. Let’s give a big Thirteenth Sabbath Offering so more people can hear the good news that Jesus is coming soon!